This is an excellent opportunity to acquire this superbly equipped spa and beauty salon in an ideal location in the centre of Oban. 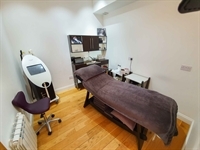 It provides a wide range of quality, clinical skin, body and eye treatments using industry leading equipment and award winning skincare brands which complement the skin spa’s prescriptive approach to skincare. This long established salon has a loyal clientele and its excellent customer service and online reviews attract new customers. This award winning salon is rated 5 stars by Salonspy with over 280 reviews. The salon offers a wide range of high quality specialist treatments to a loyal client base. It also has a very high 4.9 out of 5 Facebook review rating. Its excellent customer service and reviews attract new local clientele all year round and visiting holiday makers during the tourist season. It offers non-surgical procedures including Ellipse IPL Skin Rejuvenation, laser hair removal, Genosys Dermafix, microneedling and LED Phototherapy. It incorporates the award winning cosmeceutical Image Skin Care range of products to offer unsurpassed facials and chemical peels which complement an extensive range of body treatments all carried out in a clinical setting. The salon has a modern online booking system for customers to select their treatments and choose their appointment times. It also retails a wide range of award winning skin care products. Business, leasehold interest, equipment, fixtures & fittings for sale plus stock at valuation. The premises are leasehold and the rent is £9,600 per annum. The current lease runs until 2024. Rateable value is only £7,400 so no rates are payable. The premises are a bright modern ground floor unit in Oban town centre with two spacious treatment rooms, reception, retail and waiting area, nail bar and toilet. This 43m2 (454sqft) salon is in excellent walk-in condition throughout. There is ample pay-and-display on street parking outside the salon. The area adjacent to the main shopping parade in Oban and close to popular cafes, bars and restaurants. 9.30am - 4pm Mon - Fri, 9am - 4.30pm Sat, closed Sun. The owner with three part-time therapists.